If you live and surf in the UK or Ireland and you’re worried about being too warm in the water there is no need to worry - our magical isles have a way of ensuring it’s rarely an issue. Nevertheless, choosing which wetsuit to buy and which to wear on any given day takes a bit of thought. Bear in mind this table is designed for average seasonal conditions and water temperatures but the air temperature and especially wind chill can make a huge difference. You could be comfortable in a 4mm on one winter's day with calm weather, a little sunshine and average air temperatures and freezing cold the next day if the wind gets up, the temperature drops and the cloud covers the sun! Without boring you all to death picking a wetsuit depends on the season and this often catches beginner surfers out. 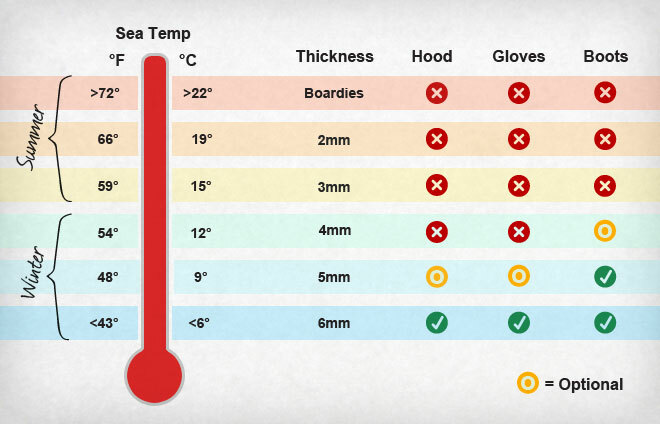 Bear in mind the sea heats up very slowly, the sun can be shining and the air warm for a few months before it makes a real difference to sea temperatures, so the wetsuit seasons always run a bit behind the actual season. Spring is cold in the water even when the sun’s shining, a winter wetsuit is worn by many surfers right up until May/June on a cold year. Once summer comes and the water heats up the warmer temperatures can last right through to the end of October so your summer wetsuit will stay on longer than you might think. The worst winter chill is February when the sea has had time to cool to match the air. Picking a wetsuit also depends hugely on your budget, we can’t all afford the luxury of a wetsuit to match every condition so with our help we have categorised things for you. If you are a bit of baller then get a 3mm, 4mm and a 5mm wetsuit. The lifespan of a wetsuit is directly related to the number of hours it spends in the water so although you’ll spend more money up front ultimately you’ll need to replace your wetsuits less frequently so long term you’ll spend no more and you’ll always be able to pick a perfect match for the temperature. Most surfers own a ‘summer’ suit and a ‘winter’ suit. Typically one 3mm and one 5mm. In reality, the 5mm probably spends about 7-8 months in the water and the 3mm the rest depending on your preference and where you surf. For most surfers on a limited budget, the money goes on a top of the range winter wetsuit such as the Rip Curl Flashbomb and economising is done on the summer wetsuit when warmth is less critical and the thinner neoprene already means the wetsuit is stretchier such as the Rip Curl Dawn Patrol. Beginners faced with the means to own only one wetsuit often put their money on a 3mm wetsuit. Your first surf lesson was in the summer and it was the cheapest option. Bear in mind you’ll definitely need to upgrade for late autumn and winter. There’s no getting around this but a 3mm in winter is horrible, you’ll be agonisingly cold however much of a hard nut you are. 4mm wetsuits often seem the ideal compromise, it’s a little warm in the summer and sufferable in the winter. If you’re a fair weather surfer likely to sit out the coldest months like January and February it can see you through most of the year, or with a hooded vest and decent accessories there are plenty of committed surfers for whom flexibility is key surfing the winter in these wetsuits (in the South West of the UK at least). If it were us and if you only own one wetsuit, and you want to surf as much as possible through the year, grab a 5mm winter suit. Be warm in the winter and spring, very warm in the autumn and cooking in the summer. Being too hot in summer is nothing on being too cold in winter and it will make your sessions last longer during that time. Worse case scenario and you do get too hot in the summer open the neck, splash some water in and you will be ready to go again. Rip Curl wetsuits are ready to order right now here at Green Overhead. Simply click here to view the full range or if you would prefer to talk to one of our rubber fetish experts please feel free to give us a call on 01803 659770 so we can find the best wetsuit for you!